Complete Family-Med Custom Orthotics are custom fit, engineered foot and arch support inserts easily transferred among your shoes and boots. These orthotics were developed after years of research by European engineers studying foot biomechanics, resulting in the development of an Orthotic that will train your foot into a more correct position. These custom fit orthotics help to relieve foot pain as well as back, shoulder, neck, and knee pain, and tired aching legs, hip problems, flat feet (dropped arches), heel spurs, plantar fasciitis, shin splints, sports injury, hamstring tightness, growing pains, corns, calluses, bunions, and tendonitis. HOW CAN C.F.M. ORTHOTICS HELP ME WITH ALL THOSE PROBLEMS? Your feet are very important. When functioning properly, these wonderful devices are our body's shock absorbers and help determine the alignment for our skeletal and muscular system. 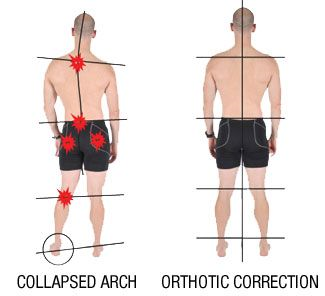 A biomechanical problem in our arch can affect total body function. Fit specifically to each foot, our orthotic helps realign the foot, supporting and correcting where necessary. Maintaining a healthy well-balanced foot will help relieve pain and fatigue throughout the body. 87% of us have foot related problems and our feet might not even hurt! Our feet were not designed to be trapped in stiff footwear or to walk on flat, hard surfaces. Over the past hundreds of years, arches generally have gotten stiffer and weaker, making it difficult for them to fulfill their major purpose ... shock absorbing and setting up the alignment for the rest of our bodies. Rather than treat a specific symptom we holistically treat the foot. This allows the body to heal itself which helps repair all symptoms you may be experiencing. As shock absorption and alignment improves, muscles can start to relax and our skeleton can realign to help resolve chronic pain. Sometimes improvement can be felt almost immediately, in other cases a bit longer. Our orthotics are warranteed against defects in material, form or flexibility for 5 years. For replacement or adjustment free of charge, contact our office and arrange to return. A copy of your impressions and original receipt must accompany your orthotics. *Foot changes requiring different orthotics are not covered by this warranty. To get started, request a mail order impression kit. We will send you the kit with instructions to take impressions of your feet. Send it back to us and we will create your custom orthotics to send to you. You can also see upcoming events we will be at if you would like to order in-person. I bought orthotics from you at the Saskatoon Horse Expo and thank you so much! You remember how sore my feet and legs were at the show. Well I hardly think about them now. I just signed up for a mini triathlon (it is major for me). I have lost some weight and am feeling much better. The orthotics definitely put me on the right path. All of our pamphlets and other literature have our OLD address of Box 520, Sundre, AB Canada. *There is a company in the USA that also call themselves "Complete Family-Med Orthotics". They have bogus contact information, a defunct Washington address, and do not custom fit. We are not associated with them in any way.